Kids love them, especially Niko. They make his tail curly. So I got new Honeysuckle Candy toys. Today, February 28 is Niko's 6th Gotcha Day. showering him with Honeysuckle Candy toys. Niko is our sweet furry honey bun. We love you, darling Niko. Goro likes to make himself a burrito. on a carpet like this. Goro asked me to be his Valentine. I of course said yes! a belly rub as a Valentine's Day gift. After we got up, Goro took me out for picnic. But it was freezing cold outside! Goro, can I borrow your fur coat? I made a cup of tea to warm up. Then Goro furred it up for me. Goro also made me a pee heart. And didn't even cover it! Best of all, he gave me a box of Goro. It was the best Valentine's Day ever! I hope everyone had a wonderful day, too! this super cute Lucky Cat stickers! to bring good luck with their beckoning paws. Look at these adorable beckoning cats. We already feel very lucky! 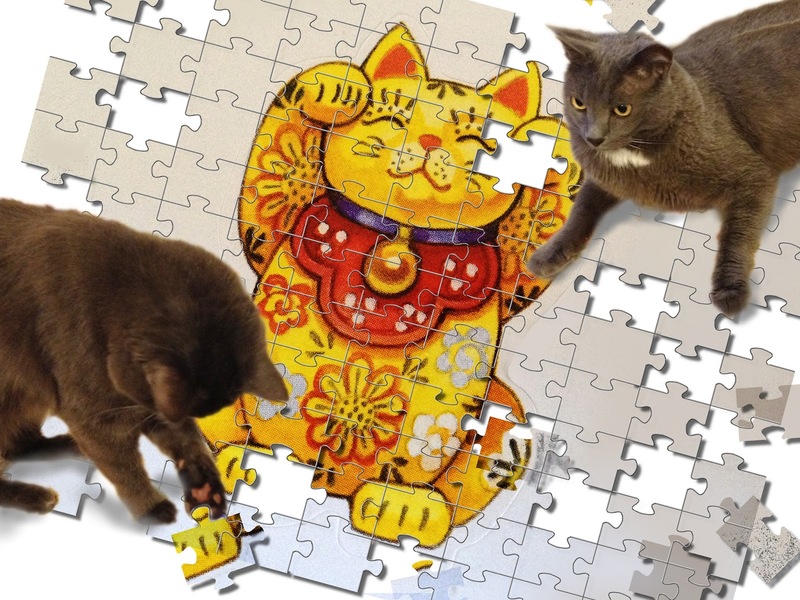 We love your Lucky Cats!